There are two portion sizes we use as standard when referring to wedding cake servings, the first is a dessert portion of 2” x 1” x 3.5” slices, which is an ample and generous size. Top tip: Save some pennies and think about having a two course sit down meal and then incorporating the wedding cake as your dessert. ​This serving size would be perfect for this idea, especially if you serve with ice-cream, fresh cream or a fruit coulis. 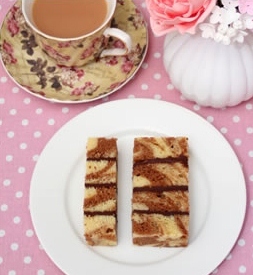 If you are planning on serving the cake after a three course sit down meal, you may be happy for your guests to have smaller finger slices with their coffees, in which case a finger coffee slice of 1”x 1”x 3.5” may be the right size for your guests. You will of course, get more portions from your cake if you choose this size. Be sure to let the venue, or who ever is cutting your cake what size you have chosen for your guests. Please note. Fruit cake portions are normally always cut into the smaller finger slices. The below guide should give you a rough estimate of what your cake will provide, depending on what style of slice you choose.